The Bastrop County Courthouse, dominating Bastrop’s courthouse square, is surrounded by small residential buildings making for a rather slow-paced setting, as compared to the typical commercial surroundings of most other small Texas courthouse towns. Also in the square stands the distinctive 1891-1892 Victorian, Old Bastrop County Jail. On the square, but not included in the nomination, is the 1971 Public Safety Building to the southeast of the courthouse. The Bastrop County Courthouse is a three-story, stuccoed brick, Neo-classical Revival structure with a copper-domed clock tower in the center of a flat roof. Designed by J. W. Preston and Sons and reviewed by F. E. Ruffini, the courthouse was built in 1883-1884 and utilized the traditional cross-corridor plan of Victorian courthouse design. The exterior reflects the interior spaces by a series of projecting pavilions on each facade. The four sides are similar in massing, consisting of a five-part composition: a central projecting entrance pavilion, flanked by two recessed sections, and projecting corner pavilions. Every facade has a raised parapet above a heavy copper cornice, with stepped parapets over the projecting pavilions. The top two stories are treated as a piano nobile divided from the first story by a wide stringcourse. The north facade is identified as the main entrance. A one-story porch with balustrade, supported by paneled piers and Doric columns in antis, shelters the double doors on the first floor. Similar entrances on the east and west facades have double doors providing access to the balcony above. Three types of window heads are employed in the composition. Round-arched hood molds with keystones are used for the bottom story in the corner pavilions and in the upper story windows of the east and west entrance pavilions. Stilted transverse-arched hood molds with keystones are incorporated in the first floor windows in the recessed sections and in the upper story windows in the corner pavilions. Flat arches without keystones are used for the upper story windows in the recessed portion to each side of the central pavilions. Originally, before the 1924 effort to modernize when many of the decorative architectural features were trimmed from the courthouse, the building was not stuccoed. The dome, with windowed room beneath, had exterior galleries and balustrades. Four entrances were enriched with pedimented porticos, stone steps, cast-iron balustrade, and cast-iron columns with foliated Corinthian capitals. The dentiled cornice was of galvanized iron, and the corner pavilions were topped by a balustrade embellished with urns. No plaster was used in the interior, as a wood paneled ceiling, walnut staircase, and unusually high wainscoting were incorporated. Encaustic tile, bronze hardware, and double thickness glass were used throughout. Immediately adjacent to and west of the courthouse, stands the three-story tan and red brick Victorian Old Bastrop County Jail, designed and built by Martin, Byrnes, and Johnston in 1891-1892. During this era of romanticism, the designers made no effort to symbolically represent the function of the building, as was the style of the day. Rather, with the contrasting red brick in the pilasters and stilted arches, the intent was to create a dignified and interesting building, which appears essentially the same today as it did when it was built. The walls are divided vertically by red brick pilasters and quoins. Molded red brick is used for hood molds over stilted segmentally-arched windows connected by stringcourses of the same brick. The top stories are grouped in a piano nobile. The lower story windows are double hung sash, four-over-four light windows. Concrete stringcourses under the windows act as sills, and a concrete water table is also employed. Iron bars cover all windows and doors. Star-shaped iron escutcheon plates are located at floor level on the second and third floors. The west body of the building is capped with a mansard roof, and the east wing has a low hipped roof, both of standing seam tin. A pedimented gable tops the projecting bay in the north or front facade. Five tall corbeled brick chimneys and a metal cornice complete an appropriate crown for the composition. A portion of the projecting bay is recessed, marking the front entry which has a single door and two light transom. In 1925 the Southern Steel Company of San Antonio extensively remodeled the interior of the jail at the cost of $7,295. Improvements in the ventilating, heating and sewage systems were included in the remodeling, making the quarters more habitable. The community of Bastrop was first settled in 1829 where the “El Camino Real” crossed the Colorado River. Among the towns founded when Texas was a Mexican state was Bastrop, or Mina as it was called then, laid out in 1830 by empressario Stephen F. Austin. Bastrop was named for Baron Felipe Enrique Neri de Bastrop, a Dutch immigrant who used his influence in enabling Moses Austin to secure a land grant from the Mexican government for the purpose of settling Anglo-Americans in Texas and in aiding Stephen F. Austin in establishing the Republic of Texas. 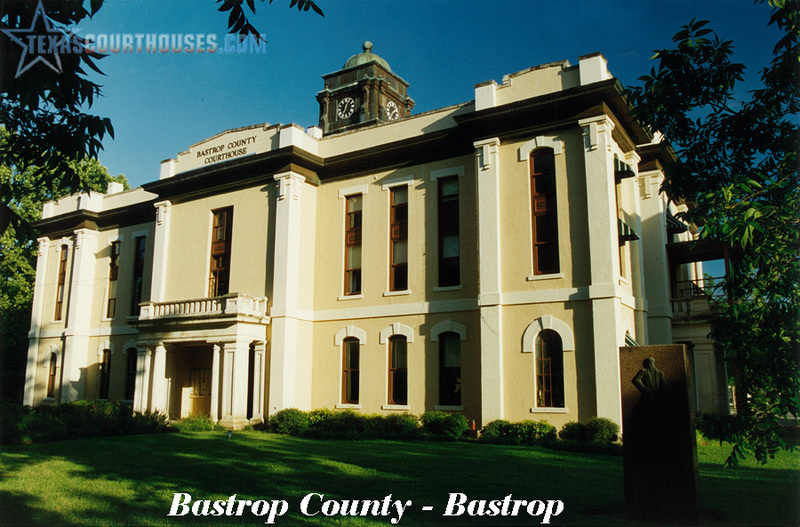 Bastrop County, created in 1836 and organized in 1839, was one of the original 23 counties in the Republic of Texas. Several different structures housed the courthouse and jail before the present facilities were built. The “ayuntamiento,” or municipal council, in 1834 ordered a two story, two-room house built in the southern part of town to serve as the first courthouse. In 1840 the county bought a residence on lot 17, west of Main Street, for use as the courthouse until 1855. 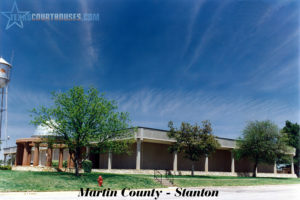 A third courthouse had its beginnings in 1851 when the corporation of Bastrop appropriated funds to build a two-story courthouse and jail of brick, on the site of the present day courthouse. It was completed in the late 1850s and served until it burned in January, 1883. After the fire, the court immediately raised funds and in February accepted the plans of J. W. Preston and Sons to build the present courthouse. Mr. Preston lived in Austin, Texas, from 1875 until 1886 when he moved to Los Angeles, California. While in Texas, he planned and built a large number of commercial buildings including the Driskill Hotel in Austin, one of the city’s finest buildings (National Register of Historic Places 1969). F. E. Ruffini, designer of many monumental Texas public buildings, including the Old Main Building at the University of Texas, was associated with Preston, at the time the Bastrop County Courthouse was being designed. Ruffini reviewed and perfected the courthouse plans and specifications. Though the building cost was $33,000, Ruffini estimated its worth at the time of its acceptance by the court to be $45,000. In April, 1884, John McDonald, builder and contractor, reported the building ready for inspection, and the court received it and moved the county offices into the building. This courthouse, built of red brick and stone, is still in use in the same capacity for which it was created. Extensive remodeling, including new floors, modern heating, lighting and plumbing at the cost of $53,000, was completed in 1924. At this time the dome was lowered and various architectural details were removed. A modern effort for more office space and a Commissioner’s courtroom resulted in the addition of a wing to the south of the original building in 1953-1954 by the Austin architectural firm of Page, Southerland and Page. In 1971 a new jail and sheriff’s office were built on the courthouse square immediately to the southeast of the courthouse. The firm of Martin, Byrnes, and Johnston of Colorado City, Texas, builders of numerous Texas courthouses, including the Fayette County Courthouse (National Register of Historic Places, 1975), constructed the jail in 18911892. In 1925 the jail was remodeled by the Southern Steel Company of San Antonio. 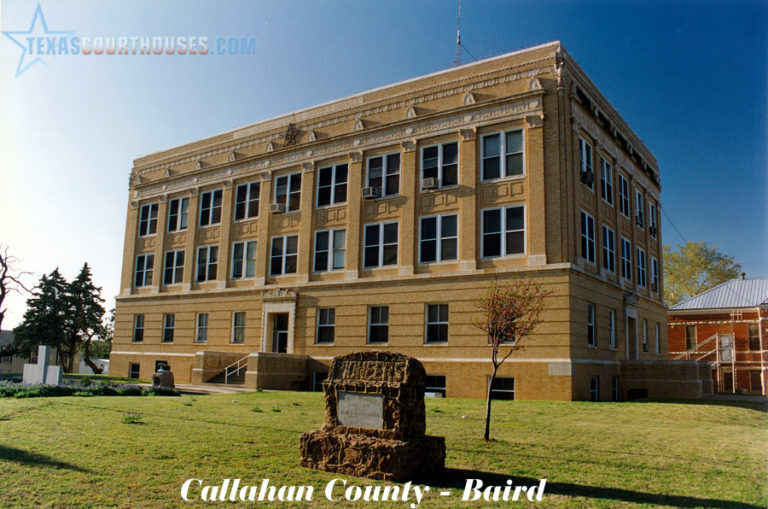 The old jail has been vacant since recent construction of the Bastrop County Public Safety Building on the courthouse square, but the county has offered use of the building to the Bastrop County Historical Commission as a meeting place and possible museum. Although the Bastrop County Courthouse has been altered substantially from its original fine Neo-classical form, the structure is historically significant to the state for representing the governmental organization of one of the first Anglo-American settlements in Texas. Linked with the courthouse, the Old Bastrop County Jail is not only historically important, but is architecturally important as well as a dignified and interesting Victorian building.